Back in high school, I swam competitively, but then chose a college without a pool. In college I began running casually to try to stay in shape and help clear my mind. I really started running regularly after I graduated and moved to Philadelphia. In 2014, I joined my neighborhood run club called the West Philly Runners. Each Wednesday we would run 2, 4, or 6 miles and finish at a local bar to hang out afterwards. They’re an amazing group of people and I loved exploring Philadelphia with them. In part, I still run for fitness. I also enjoy seeing what my mind and body are capable of, whether I’m trying to run a little faster or a little farther. My friends at WeRunSF are definitely my biggest inspiration and motivators. I’m always amazed by their running exploits, dedication to training, and how they always manage to have fun while doing it! Right now I try to run 3 days a week for a total of 20-30 miles. Each week, I try to fit in a speed workout, the WeRunSF Wednesday night run, and a longer run on the weekends. Two mornings a week, I also try to do some strength training at the gym. My favorite workout is definitely the WeRunSF mid-week run. I love the social aspect and energy of running with the group. 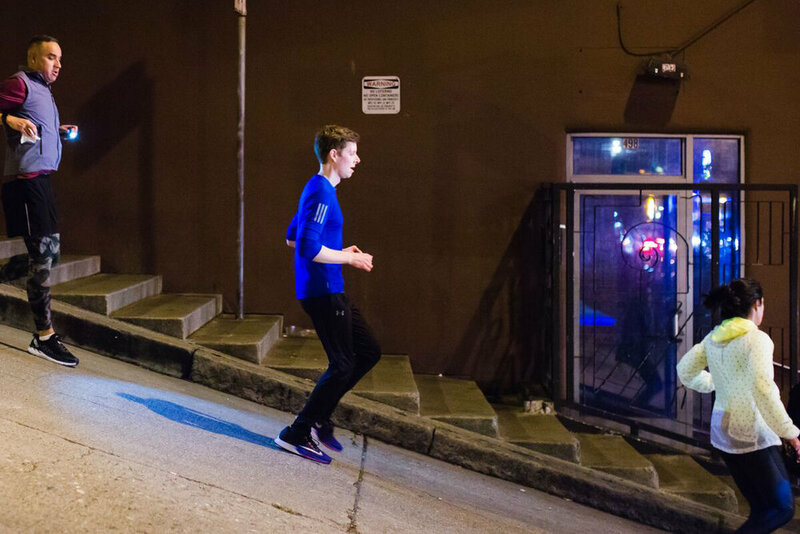 It’s also a great opportunity to run with people who are faster than me and it takes me through parts of the city that I wouldn’t normally run in. I haven’t done many races and I’m still trying out different distances. I tend to pick my races based on their history rather than their distance. For example, I try to make it back to my hometown of Cumberland, Rhode Island for the town’s annual 4 mile 4th of July road race each summer. I’ve also run San Francisco’s own historic Bay to Breaker’s, which is a quirky race with an unusual distance. My favorite race so far has been Philadelphia’s Broad Street Run, which is a 10 miler spanning the distance of the city from north to south. The race takes you through many of Philly’s unique neighborhoods and the crowd energy is amazing! I’ve always wanted to try running a marathon, so my immediate goal is to complete the SF marathon this summer. After that, I’ll have to see. When I’m not running I like to explore the city, play board games with friends, and find divey out-of-the-way venues to listen to live music. Thank you Andrew for being a part of the WeRunSF family and good luck with your goals.